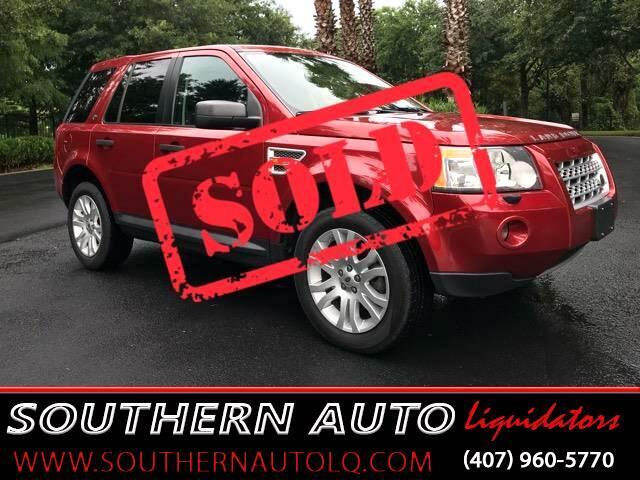 You are looking at a 2008 “Rimini Red” Land Rover LR2 SE 4WD SUV. You could technically call the 2008 Land Rover LR2 a crossover, as it carries its SUV-like body on a smooth-riding independent suspension. But the LR2 comes with Land Rover's Terrain Response System and some pretty good off-road stats, such as 8.3 inches of ground clearance and the ability to wade through 19.7 inches of water. We were also pleased to see that Land Rover seriously upgraded its cabin electronics for the LR2 over what we've seen in other Land Rover models. The LR2 has comfortable suspension tuning. While still firm, as is common among luxury crossovers, it manages to absorb impacts without excessively jarring cabin occupants. When we test-drove this car, we honestly thought it was a V8, we had to double check in the manual. The pick up and speed in this car is amazing. The LR2 uses a transversely mounted 3.2-liter inline six cylinder, which puts out 230 horsepower and 234 lb-ft of torque. We were impressed in the engine's power. The LR2 isn't going to win drag races, but it can be made to move fast off the line, and works well in passing maneuvers. The transmission works diligently to execute smooth shifts, so it feels like one gear is just blending into the next one. The LR2, as we would expect for a Land Rover, features solid off-roading gear. Its all-wheel-drive is full-time, and it has Land Rover's Terrain Response System. The driver gets a dial in front of the shifter that can be turned among four settings for normal roads, gravel, snow, or sand. Each setting puts different torque characteristics to the wheels and can raise the suspension. The handling on the LR2 is what you would expect from a Land Rover, the steering is tight and accurate. The LR2 comes with loads of road-holding and safety gear. Along with its anti-lock brakes, it gets stability control, roll control, cornering brake control, and an emergency brake assist system. And it also gets a special hill descent-control mode, useful on- and off-road. The LR2's backseat has firm cushioning, like the front bucket seats. Headroom is good even with the standard panoramic moonroof, which typically robs headroom, but not here. The back seat folds down, adding a ton of cargo space. This LR2 comes fully equipped with: Power Seats, Locks, windows and Mirrors. Panoramic Moonroof. Heated front seats. Heated Windshield. Steering Wheel Controls. AM/FM/6-CD CHANGER/AUX/Bluetooth Radio. Alpine 12 channel 440-watt Dolby ProLogic II 7.1 surround sound system with 12 speakers. With a Dolby ProLogic II 7.1 surround sound system. Push Start Engine. Land Rover's Terrain Response System. This car was very well taken care of, both inside and out. Very clean and regular maintenance has been performed throughout it’s life. It also had an alignment done and brakes checked, just last month. It’s in great condition, and drives like a dream. Come check it out for yourself! Call to schedule a test-drive, today! Message: Thought you might be interested in this 2008 Land Rover LR2.